When Russ and I were living in Madison, Wisconsin in the late 70s, there was an invasion of northern owls into the Duluth area, and a lot of my friends drove up one weekend to see their lifer Boreal, Great Gray, and Northern Hawk Owls. I was sick with the flu and missed the trip, but from then on always associated northeastern Minnesota with incredible owls. After Russ earned his Ph.D. and had a few job offers, I lobbied for the one up here because of all those owls. 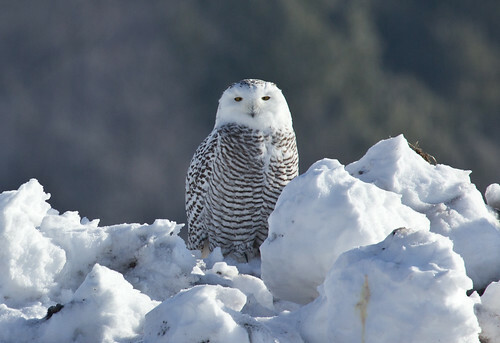 I’m not the only one who equates Duluth winters with wondrous owls—year after year, people from every state and several foreign countries come up, hiring guides or combing the Sax-Zim Bog on their own, all in search of owls. In 1998, three men competed in a record-setting Big Year memorialized in the movie The Big Year—all three of them came to Duluth to get their owls. As digital photography and social media have grown in popularity, the fame of our owls has mushroomed. When people travel hundreds or even thousands of miles to see and/or photograph an owl, and then spend a frigid winter day in a remote bog, they want a payoff. But more and more, this wanting has evolved into a sense of entitlement. Now many people arrive here armed with bait, so when they do spot an owl, they can easily lure it in for close-ups and thrilling flight shots. Some professional birding guides (not the local ones that I know of) use bait so their participants will get incredible instead of ordinary views, and a great many photographers do this. They use two kinds of bait—live rodents and dead or fake ones at the end of a fishing line. When they spot an owl, they toss a hapless mouse or gerbil out onto the snow, or cast out a fake one and reel it in. Our winter owls are astonishingly alert—they almost always fly in instantly when they spy a rodent, instant gratification for the photographer that reinforces the practice. Some birders and photographers don’t see a problem at all. Some have enough misgivings about the ethics that they are secretive about doing it. And some twist arguments to act as if baiting is perfectly fine, or if not, is no worse than setting out bird feeders for songbirds. Baiting owls is not at all comparable to traditional bird feeding. Americans have been offering breadcrumbs and seed to birds since before the time of Thoreau and Emily Dickinson. Little by little, we’ve learned that some practices are harmful—for example, we know that wet seed in spring can provide a medium for botulism and other pathogens, that wet corn and peanuts can become contaminated with aflatoxins, and that bread doesn’t provide enough nutrition for most birds and can encourage House Sparrows, starlings, and rodents. 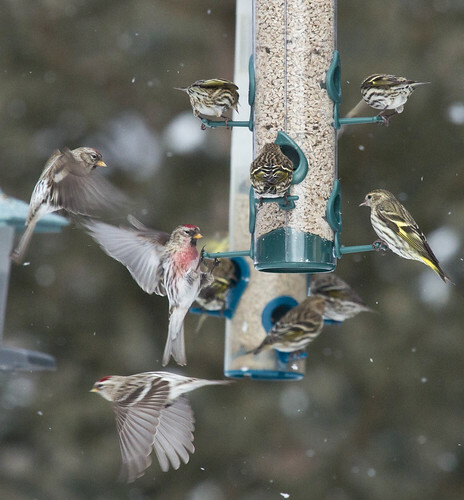 The Cornell Lab of Ornithology, which encourages backyard bird feeding, has conducted decades of research into best practices, and disseminates a huge body of accessible information far and wide to ensure that backyard bird feeding is as healthy for the birds as it is enjoyable for people. No one has thoroughly researched any best practices with regard to owl baiting. All we have are anecdotes. Most photographers and birders who lure owls claim never to have seen any bad effects, but many impartial observers have witnessed owls hurt or killed directly or indirectly due to baiting, and so the preponderance of data is clearly against the practice. The Raptor Center in St. Paul, the OwlFoundation, the Raptor Education Group, and Project SNOWstorm, world-class organizations with a thorough understanding of owls, are all on record opposing baiting, except by licensed bird banders or to trap individual owls to remove them from a dangerous situation or bring them to a rehab facility. Baiting owls with fake mice is a horrible practice, immediately harmful to the owls. Owls cast pellets consisting of felted fur and all the bones and other indigestible matter in their prey. These pellets are formed in their lower stomach—the muscular gizzard—and must pass through the glandular stomach and esophagus to be spit out. These organs are emptied of fluids before the owl regurgitates the pellet. Before swallowing the next meal, the owl "primes the pump" by siphoning off body fluids back into these organs, which is accomplished as the owl spies and closes in on prey. Doing this and then coming up empty, as always happens when the owl chases a decoy, is very harmful, especially for owls that are hungry and growing dehydrated. When this is repeated over and over, as many photographers do for more photos, it's extremely frustrating for the poor owl as well as potentially destructive. There are also many reasons why luring owls with live rodents is bad for the owls. First, owls that are baited quickly learn to associate people with food, sometimes leading to extremely dangerous situations for both people and birds. And most baiting is done from roadsides, luring owls in to immediate danger. Last year, one photographer actually tried luring a Boreal Owl across busy Highway 61 so he’d have better light for photography, despite the fact that Boreal Owls seldom fly above the height of logging trucks. Considering that a primary cause of mortality for owls in winter is collisions with cars and trucks, this was unconscionable. 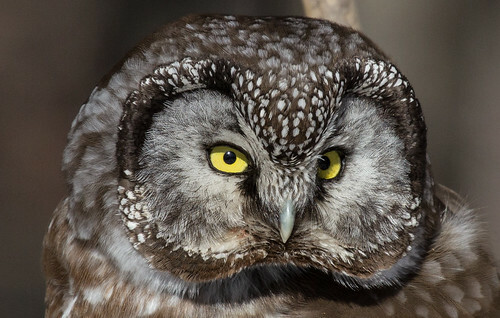 In 1997, when a Boreal Owl turned up at the Springbrook Nature Center in Minnesota, the staff, concerned about the bird and thrilled about so many birders coming to see it, started providing daily handouts. The vast majority of the bird's pellets that winter consisted of white mice raised at the facility--it was feeding on very little natural food all season, but fortunately, the mice were raised at the nature center. When spring arrived, the owl didn't migrate north according to a post by Michael Hendrickson on MOU-net in 2009. I'd defended the feeding in 1997 because it was an exceptional situation--it was Mike Hendrickson's information and apparent inside knowledge about the fate of the bird that led me to think even that exceptional circumstance might not have warranted artificial feeding. Regardless, though, that was indeed an exceptional situation. Northern owls seem far less fearful of people than most birds, often not fleeing until people have come within a few feet. There is no evidence that most of these species are the least bit tame, or associating people with food--they are simply trusting to their cryptic coloration and saving energy. Many spend their lives in remote areas where large mammals aren't particularly interested in them, so are less fearful than most birds. 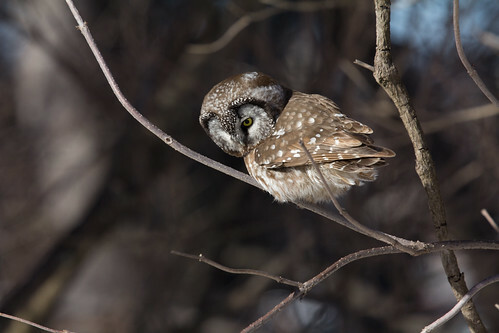 Northern Hawk Owls often actually approach people, whether or not the birds have been baited. They seem to share with Gray Jays the inclination to follow large predators in case they can capitalize on a feeding opportunity—there are records of them grabbing snipe shot by hunters before the hunters could retrieve them. 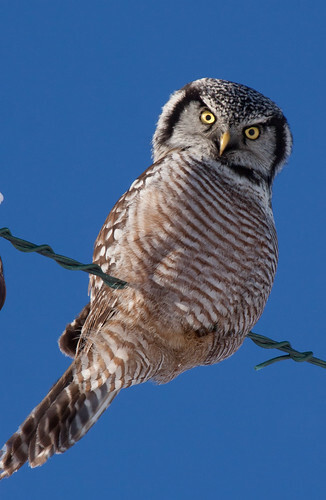 I've taken many closeup photos of hawk owls, including the one at the top of this post, without ever baiting. I've also photographed them catching voles and other prey, no baiting involved. When Boreal Owls descend on the North Shore of Lake Superior in winter, they are sometimes so hungry that they abandon their normal nocturnal habits and hunt by day. Photographing them is quite possible without baiting. Pet store rodents are notorious for carrying salmonella. 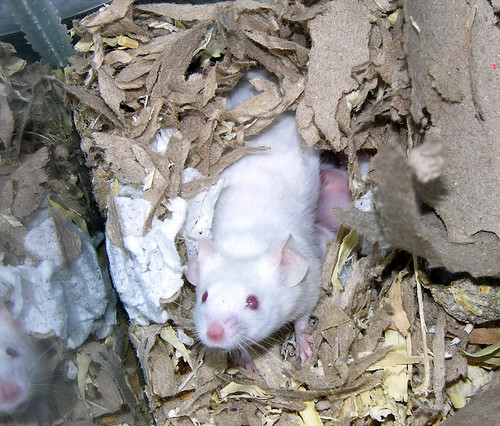 The Minnesota Department of Health and the Centers for Disease Control have published accounts of children contracting salmonella, including multidrug-resistant strains, from pet store mice, rats, and hamsters. The affected children had merely played with and sometimes kissed their little pets—as predators that consume the entire bodies of their prey, owls are even more vulnerable to swallowing pathogens. Of course, as natural predators feeding on raw meat, owls are more resistant to salmonella than we humans, but two species that are baited extremely aggressively by photographers, Great Gray and Boreal Owls, are typically most conspicuous when they are physiologically stressed, with their immune system already compromised—this is when they would be most vulnerable to disease organisms. My focus has always been on birds, but I’m also partial to rodents. It’s ironic that I’d consider the feelings of the little mice tossed onto the snow, considering that I myself thaw out a mouse every night for my education screech-owl Archimedes. But the frozen mice I purchase were raised and then killed humanely and in clean circumstances so are guaranteed not to harbor diseases, and I still feel sad about them. The ones tossed out on the snow are kept warm and cozy right up to the moment someone grabs them out of a cage and throws them onto the frozen landscape. Then, in the best-case scenario, they get grabbed and devoured before they have time to think. In the worst-case scenario, they escape, but are lost, bewildered, and cold. If they manage to survive, that introduces another exotic species and its attendant parasites and germs into the natural landscape. Some photographers justify baiting owls by claiming that their photos are valuable for conservation and environmental education, when in reality many of these photos actually promote misinformation. One photo showing a Great Gray Owl closing in on a mouse won awards and was conspicuously displayed on the National Geographic and Nature Conservancy websites, even though it was a house mouse on the surface of the snow—something that would simply never happen in a wild situation. Over 90 percent of a Great Gray Owl’s normal diet consists of meadow voles, which never walk on the surface of deep snow—they construct tunnels at ground level under grass, so even when there is no snow cover at all, voles stay out of sight. Unfortunately, by posting the photo, these organizations were misinforming people about the way Great Gray Owls normally hunt, and also providing misinformation about rodents. Suggesting in a photo that a hamster or white mouse or brown house mouse is part of a wild owl’s normal diet hardly promotes education. Unfortunately, magazine editors don’t always recognize these unnatural situations themselves. Photographers claiming to be photographing the natural world should not be using such unnatural set ups. We're aware of the situation in Ramsey, and very concerned about it. Jim [Williams] of the Minneapolis Star-Tribune has been writing about it, among others. The photographers feeding pet store mice to the owls are creating a situation in which the birds are becoming increasingly habituated to humans, which in a congested, suburban environment is especially risky. There's also the fact that Project SNOWstorm has invested thousands of dollars and a lot of collaborator effort in tagging Ramsey in order to learn how a wild snowy owl lives -- not to track a bird that's being fed by photographers too lazy to wait for natural behavior. It was our understanding that most of the feeding is targeted at the other, untagged snowy owl and not Ramsey, but that appears to be changing -- and it's not justified in either case. While it's not illegal, it is wrong, and we urge the photographers who are tossing mice to these owls to please stop. The project website started out displaying real-time movements of the birds, but because photographers were using the information to rush in and bait them, Project SNOWstorm had to start putting a 3-day delay on the tracking maps. Photographers, birders, and bird guides baiting these or any owls are compromising important conservation or education work, not providing anything of value except to their own egos and pocketbooks. As a former licensed rehabber who handled lots of owls, as someone who has lived with my licensed education screech-owl for 14 years, and as someone who studied bird digestion (specifically nighthawks and owls) during my ill-fated Ph.D. project, this area is something I do have some small bit of expertise in. By next winter, the Minnesota DNR will have new regulations in place prohibiting owl baiting. And in my considered opinion, that’s the way it should be. When I was a fairly new birder, right after Russ and I moved to Duluth, I went on a winter field trip to look at Snowy Owls and watched a couple get trapped and banded. The bander, David Evans, used a fake mouse tied to the end of a fishing line, which he cast out on the snow. In both cases, the movement as he reeled it in instantly caught the owl's attention—within seconds, it took off straight for the bait, only to get trapped in a net. David quickly and gently put the band on the bird’s leg, applied a colored dye to its forehead so he’d recognize the owl and not have to put it through this procedure again all winter, recorded the necessary data, and released it. I don’t think either bird was held longer than 3 minutes total. I've also watched owl banding at research stations in Duluth, Whitefish Point in Michigan, Braddock Bay in New York, and other places, where the main species being trapped from day to day were Northern Saw-whet and Long-eared Owls. When Frank Nicoletti has public programs about owl banding at Hawk Ridge Bird Observatory, he is extremely cautious about allowing flash photography, prohibiting observers from using flash on most of the birds he displays momentarily before release, and is very careful to give the owls plenty of time to adjust before releasing them in the cases where he does allow people to take photos using flash. I've watched my education Eastern Screech-Owl when people photograph him using flash. He never twitches or shows any discomfort even in low light conditions, and his pupils return to the proper size for the ambient light within less than a second after a flash. As a reasonable precaution, Frank and other banders give the owls time to adjust, and based on my observations of wild and captive birds, that is sufficient. The owl in the photo below was held with a spotlight at Whitefish Point back in 1976. (When I also saw my lifer!) No one was allowed to use flash, but it wasn't necessary with the light, which he extinguished a full minute before releasing the bird. The body of research Duluth's first owl bander, David Evans, produced in the four decades he’s been banding up here has been seminal to our overall understanding of Snowy Owls. His was some of the very first research to establish that some individual Snowy Owls not only migrate south every year, but return to the same winter territory year after year as well. He found that many of the Snowy Owls that migrate south aren’t emaciated but rather in excellent condition—something that obviously makes sense because how could they fly a thousand miles or more from the tundra if they were emaciated from the start? Even though that is common sense, it ran against the ornithological consensus of the time. Snowy Owls that were picked up dead or dying were often emaciated,but necropsies usually showed that these birds had been poisoned or suffered some kind of physical trauma, often from collisions with structures, wires, or automobiles, rendering them incapable of hunting, but these problems didn't arise until they'd started moving south. Banding data reveals that the majority of Snowy Owls reaching the Lower 48 states embarked on their migration as healthy, robust birds. This year, an exciting new program called Project SNOW Storm, is taking banding to the next level. Participants in the program are capturing Snowy Owls in the Northeastern and Great Lakes states and not only banding them but affixing a GPS-GSM transmitter to each bird, which allows them to track each bird. Duluth's own Frank Nicoletti is one of the researchers participating in the program. We're already getting valuable data that helps scientists understand Snowy Owl movements—information that will contribute to conservation of the species as well. The researchers are committed to attaching these transmitters only to individuals in robust health. Anyone who has watched banders handling birds can see that the process is stressful to virtually all the individual birds. But if you’ve observed more than a few bandings, you also can’t help but notice that many of these individual birds benefit from the banding process. One of my owl-banding friends who occasionally trapped deer mice in his house froze them while they were fresh, and stashed a few, thawed, in his pocket when he was banding cavity-roosting owls. He didn’t lure these birds into nets—just reached into their roost holes in the daytime to capture them—but when he noticed that one was underweight, he’d give it one of those mice. Some owls are caught with pre-existing injuries. I’ve known banders to remove excessive parasites, treat injuries, take emaciated or injured birds to rehabbers, and in other ways help individual birds they’re dealing with. And the lives of hundreds of Snowy Owls have been saved thanks to banders, who can capture birds at airports and relocate them so both people and those owls won’t be killed in airplane collisions. Rarely, the banding process itself causes injuries or can even kill individual birds, but in all the years I’ve been watching banders, I’ve never seen a single case of this, so know how very exceptional it is. No one can get a master license to band birds until they've apprenticed under a master bander long enough to have thoroughly learned the best practices, and banding is strictly regulated by both the US Fish and Wildlife Service and state departments of natural resources. Although the banding process helps few individual birds overall, from what I’ve personally seen, the harm it causes individual birds is far, far rarer, and banders that I've observed go to exceptional lengths to minimize the stress to each bird. And the incredible body of knowledge about most species—knowledge that has directly improved their conservation—is due more to banding than to any other research method. So I give a lot of latitude to bird banders for how they trap and handle birds. I hold birders, bird guides, and photographers to far stricter rules because their pursuit of birds is entirely for personal pleasure and financial gain, with no benefits for those individual birds. I have always loved the idea of train travel. My Grandpa worked for the Milwaukee Road. One time I got to go along when my dad dropped him off at Union Station in Chicago, and my grandpa showed me a sleeper car and the dining car—it all seemed so sophisticated and adventuresome. For a 6-year-old girl, the train provided a lot of food for thought, too. Beautifully lettered “No Spitting” signs hung in every car. I couldn’t imagine anyone—much less the sophisticated adults I pictured traveling by trains—not realizing you should never spit on a train. It was only recently, over half a century later, that I found out that the signs had been set out in crowded establishments such as trains as a public health response to the raging plague of tuberculosis. The mystique of those “No Spitting” signs stayed with me—when Russ and I brought our kids to a railroad gift shop a couple decades ago, I bought myself a metal "No Spitting" sign as well as a "Milwaukee Road" sign. Except for the Chicago el, I never rode a train myself until my first two years of college. Russ and I attended different schools then, and he and I often took the Grand Trunk Railroad between Chicago and East Lansing, Michigan, and the Illinois Central between Chicago and Champaign to spend weekends at home or visit each other. Between urban centers, trains pass through a lot of beautiful and fairly wild areas, and even before I became a birder, I loved looking out the window and noticing birds, even if I didn’t know what they were. But once we got married and bought our first car, Russ and I stopped traveling by train. So in all the 39 years I’ve been a birder, I never once rode a train until just last week. I badly wanted to hear Joel Greenberg, author of A Feathered River across the Sky: The Passenger Pigeon’s Flight to Extinction, who was speaking in North Chicago on February 20. I dreaded the thought of driving all the way—I think I’ve encountered one too many blizzards in Wisconsin in the past several years—and it suddenly occurred to me that I could take the train. I looked up the Amtrak schedule, and it was actually affordable, even more so because I’m 62—exactly the right age to qualify for the senior discount. I did have to drive to the station in St. Paul, where I left my car in the free parking lot. After that, I left the driving to Amtrak. My train was scheduled to leave the Twin Cities around 7 am, so I had to leave Duluth at 3:30 in the morning—not all that much of a problem for a birder accustomed to early rising. But the Empire Builder line—the one that runs from Seattle to Chicago, has been suffering an extremely high number of delays in recent years, exacerbated by all the oil tanker trains originating in North Dakota, so my train was 5 hours late arriving in St. Paul. If I’d anticipated this, I’d have slept in and left Duluth later, but as it was, I got to spend the time working on a writing project and visiting with one of my friends who lives near the station. The station itself was very pleasant—quiet, well lighted, and staffed by friendly, helpful people. There was no Wi-Fi, but my son Joey talked me through setting up my cell phone as a hotspot, something I used on the train, too. Once I boarded, I was in heaven. The eastbound Empire Builder passes through some of the loveliest places along the Mississippi, and I spent a lot of time gazing out the window at lots and lots of Bald Eagles along with Red-tailed and Rough-legged Hawks, an exciting variety of ducks, and a smattering of Snow Buntings, Lapland Longspurs, and Horned Larks. Sadly, the delay meant I had five fewer hours of daylight for birding from the train, but that gave me more time to work on some writing projects after the sun went down. My return train left in mid-afternoon, when the February sun was starting to get low in the sky, but in the stretch between Chicago and Milwaukee, I got a lovely look at a Snowy Owl along with plenty of waterfowl. I didn’t see a single "No Spitting" sign on either trip, but I guess we can’t have everything. It also didn't occur to me to take pictures. We’d had a lot of snow while I was gone, but the parking lot at the St. Paul station had been plowed extremely well, including removing almost all the snow from behind the cars, so I only had to clear the snow off my car and shovel the relatively loose stuff right behind my wheels to get out of the space. I’m impressed that I could park in such a well-maintained lot for three days for free. Russ and I have always longed to take a long trip in a sleeper car, and now I’m even hungrier for that. Different Amtrak lines take different routes, and I’d love to try them all. My Amtrak birding list right now includes about 20 species, and suddenly I’m yearning to see just how high I can bring it. Riding the train may be a little more unpredictable than driving thanks to the high number of delays because freight trains have priority on the limited tracks, but it uses less energy than flying or driving. I wish we had better rail infrastructure to avoid the delays, but that was a minor inconvenience in exchange for such pleasant, no-hassle, productive trips that provided such exciting birding to boot. I keep hearing report after report about this winter being the worst in 30 years. The winter 30 years ago really was a doozy. I remember it vividly because my daughter was born in December 1983, while Russ and I were still adapting to life in the frozen north, and we had a lot of difficulties bringing our tiny new baby, along with a bundled up toddler, to pediatrician appointments when there was so much snow and so many days well below zero. But I also remember Duluthians telling me that winter about much worse ones, and really, the two previous winters, when I was first living in Duluth, hadn’t been much milder. It seemed like double digits below zero happened at least several times every winter up here. Statistically, that winter 30 years ago was colder than average, but not that far off the norm. People keep saying the ice cover on the Great Lakes is the most in this century, but the century is only 14 years old, after all. For our relatively large brain size, we humans have surprisingly short memories. We used to be able to count on frigid weather and enough snow to run the John Beargrease Sled Dog Race—in the past decade, the race has been marred by postponements and even cancellations. The safe date for planting tomatoes has crept earlier in May. Temperatures on average are definitely creeping upward. This winter may be extremely cold, and a serious outlier compared to recent winters, but it’s really not so far from the norm of winters in previous decades, at least not in Duluth. We humans aren’t the only ones with memories too short to easily reconcile this year with winters past. Some non-migratory species and short-distance migrants have been wintering here in increasing numbers in recent decades, including cardinals and Mourning Doves. If the propensity to linger has a genetic component, several mild winters in a row can increase the number of birds remaining in the north whose bodies aren’t as cold hardy as would have survived previous winters, and this year’s could be having a devastating effect on some of those individuals. I haven’t been getting many reports of dead and dying birds, but lots of questions about where are the doves and where are the finches. The doves have mostly moved south, but some are remaining near feeding stations in the Northland. Both Mourning Doves and Rock Pigeons are susceptible to frostbite, unlike songbirds and many other groups. Birds in the dove family have a crop—a pouch within the esophagus in which they can store a lot of food, so when they pig out at a feeder, after they fill their stomach they can keep downing quite a bit of seed. When the crop is full, they fly off to roost on a sunny, protected perch while they digest, their belly resting on their feet to keep their toes warm. Those doves that have remained in the frigid north can be fine as long as they can count on enough food that they don’t have to waste valuable time seeking out new sources. The absence of finches was predicted way back in the fall. Redpolls, siskins, and crossbills apparently are pigging out on an abundance of food further north, and haven’t had to move south for sustenance. These are irruptive species, not moving far each year. We can look forward to seeing many more of them next winter. The extreme cold, after so many unseasonably warm years, will take a toll. Providing nutritious food for the smaller numbers of birds at Northland feeders this year will at least help some of them for the duration. When I was recently in the visitor center at Merritt Island National Wildlife Refuge, I noticed a sign encouraging people over 62 to purchase a Senior Pass, which gives the owner free admission to national parks and other federally owned wild lands for life for only $10. I had just turned 62 in November, and this seemed a great value, so I impulsively bought one. And the moment the purchase had been made and it was too late, it hit me—this pass was proof that I’d become, officially, a senior. Not that I hadn’t been one before I bought it, but somehow now my advancing age seemed more concrete. I had to face it—I’m a senior citizen. In America’s youth culture, there are a lot of negative terms for older people but few for young ones except whippersnapper. Merriam-Webster defines codger as “an often mildly eccentric and usually elderly fellow,” and geezer as “A queer, odd, or eccentric person—used especially of older men.” Both of those words give the impression of someone who might be amusing and eccentric in a cranky sort of way. I wouldn’t mind being called either, I suppose. On the other hand, I am mortally offended when anyone calls me a crone, which Merriam-Webster defines as “a cruel or ugly old woman” and “a withered old woman.” Crone is etymologically related to carrion and carcass, coming from Anglo-French for dead flesh, and the usage, focused on appearance rather than character, seems sexist to boot. No thank you. Nope--I'm not ready to be reduced to carrion. If I have to accept being called anything in reference to my advancing years, I’d like to go with old coot. Coots are cool birds—excellent at swimming, diving, walking (or waddling), and flying, at least once they get up into the air. They’re mostly sociable and friendly with one another, fairly approachable for birders, and are one of the rare birds that live their lives primarily as vegans. The oldest known coot wearing a US Fish and Wildlife Service leg band was at least 22 years 4 months when taken by a hunter, which isn’t a bad lifespan for a wild game bird, though if we wanted a symbol of longevity, the Laysan Albatross would be a better choice. The female albatross nicknamed “Wisdom,” who made the news a couple of years ago for being at least 61 years old and still raising a chick, is raising yet another one this year. She was banded as a nesting adult in 1955, when she was at least 5 years old, and remains the only known bird who is older than me—at the very least, she’s 63 now. She’d make a perfect symbol for senior citizens—almost old enough for social security but still leading a productive and fulfilling life. But thanks to Samuel Taylor Coleridge, albatrosses already symbolize innocent victims or burdens of shame, so I’m not expecting people to call me an old albatross anytime soon. No one ever calls anyone an “old chickadee”—chickadees have lived in the wild for over 12 years, but somehow even the oldest chickadees just don’t conjure up the image of senior citizens. Some people have reminded me that old coot is typically used to refer to men, not women, but there is no data to support the idea that real coots have anything other than a 1:1 ratio of males to females at any age, so there’s no reason to restrict old cootdom to men only. Whatever we call it, I'll negotiate old cootdom the way I've gone through my life all along, taking each day as it comes and not worrying about things before they happen. You know, the way real coots do it. I usually tell that story when I’m explaining about Irish wakes and weddings, fueled on beer and tears. But really, in essence, that story is about the transformative moment when we recognize an essential spark of life and individuality and value in someone other than a human. For most of us, be we photographers, hunters, or birdwatchers, a bird is a target. Whether we’re using a camera, gun, or binoculars, we see birds as quarry to be captured and possessed, for looking at, holding in our hands and eating, or augmenting a bird list. We may smile or even cry at that Bud commercial without actually believing a Clydesdale can form a meaningful bond with a man or a puppy. Even if we believe our pets and some other animals have an essential spark of individuality and intelligence and heart and even soul, the tragic reality of life on earth is that all animal life takes its energy and physical being directly from the lives of other living or once-living things, plant or animal. The moral complexities and paradoxes of reckoning with the value of other beings are too much for many of us to deal with, so we close our eyes to them, intentionally or without even considering the possibilities. My uncle never noticed the spark of life and soul in any duck until he watched it ebb and die in one individual, and at that moment, he made what was the only moral choice he saw—to stop shooting ducks for sport. He didn’t stop eating meat, nor did he see any moral paradox in that. All animal life springs from death, and even if every animal has value, so do we, and even the vegetarians among us take the lives of something in order to sustain their own. But in that transformative moment, my uncle broke from the comfortable view that animals were set here on earth for us, with no inherent value beyond what entertainment, sport, nourishment, or ecological well being they provide for us humans. When I consider what the difference is between humans and animals, I see our intelligence and emotional capacities as differences in degree, not in fundamentals. Maybe the essential difference is that we are capable of puzzling through the vast moral complexities, ambiguities, and paradoxes of our lives. Whatever it is, reckoning the individual worth of our fellow creatures causes a sea change in our own perspective; that very reckoning enlarges us as human, and humane, beings. Many hunters I know are indeed able to see the moral complexities. My discussion of that is in A Question of Hunting.